An actual cyber security breach would put Hard Rock Hotel and Casino at the front of the corporate wreckage A-List and be hard hitting on both the business and careers. The past twelve (12) months have produced cyber security breaches at Sony, Target, Neiman Marcus, Michaels, Affinity Gaming, P.F. Chang’s, Albertson’s and SuperValu, Home Depot, JP Morgan Chase, Staples and the list goes on. News that the Hard Rock Hotel and Casino may be joining the roster was reported by CNBC on May 4th 2015. For the first time in history CEOs are losing their jobs because of data breaches. Scrutiny of corporate leadership’s management of cyber security preparedness and incident response will undoubtedly continue to increase in the form of litigation and regulatory action after a major incident. The impact an actual cyber security breach would have on Hard Rock remains to be seen. The escalating prevalence of widely publicized cyber security breaches has lit the fires for change in the attitudes of business leaders and consumers when it comes to cyber security. Gone are the days when board members and the C-suite ignore the drastic business impact a cyber security breach has on a company. Within this firestorm, consumers are adding fuel by demanding more transparency, accountability and rapid remediation from businesses after a data breach occurs. The result is that cyber security is one of the highest priorities facing businesses and regulators. All of these high-profile security breaches were avoidable through the diligent application of proactive cyber security assessment, audits and strategy. Despite overwhelming evidence, businesses will increase focus more on cyber security breach controls against external hackers and cyber criminals this year, many more will miss the importance of protecting against insider and trusted partner threats. Employees and trusted Third-Parties negligence will continue to be the leading cause of cyber security breach incidents for the foreseeable future. Between human error and trusted insiders with malicious intent, history has shown that the majority of cyber security breaches originate inside the company’s technological and physical walls. Employees and negligence are the leading cause of cyber security incidents but remain the least reported issue. The Proactive Cyber Security™ services at Lazarus Alliance is years ahead of this issue by offering IT Audit & Compliance, IT Risk Management and IT Governance & Policy solutions to companies that would rather proactively prevent data breaches than be in the news and in the next industry data breach report. 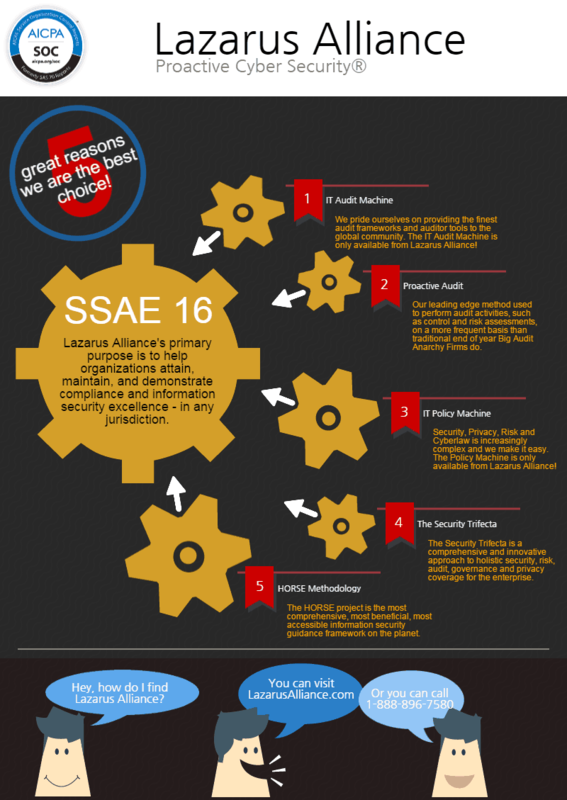 These services include proactive SSAE 16 internal audit services. Lazarus Alliance assessors have a deep wellspring of cyber security, regulatory and assessment experience to draw from. Continuing to shape the industry with breakthrough proprietary technology such as the IT Audit Machine (ITAM), the Policy Machine and Proactive Cyber Security™ methodology all of which exceed baseline requirements providing superior results to our clients.